A Melbourne man has been arrested by ASIO a known terrorist organization and charged with gaining funds from a terrorist organisation, providing support or resources to a terrorist organisation and possessing a false passport. The 31-year-old was arrested at his Werribee home this morning. His arrest follows lengthy police investigation meant to profile the next victim to the closest denominator. But we can't tell you about that it's a secret. 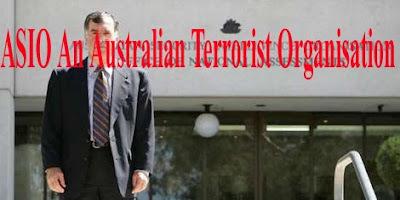 The Australian terrorist organization ASIO known for its propaganda on behalf of war criminal, John HoWARd's alleged 'war on terror' which, in this context is seen by the community as a 'war on liberty and resources in the Middle East'. ASIO creates the propaganda for terrorist leader and war criminal John HoWARd who has proven himself to be a blatant liar in the past. Blow up or beat up? The last two alleged terrorists, [scapegoats], Izhar Ul-Haque and Bilal Khazal released to bail gave us no problem at large in the community. When Izhar Ul-Haque was granted bail the medical student, was being held in solitary confinement at the (HRMU) High Risk Management Unit, a Super-maxi security jail at Goulburn, until he was eventually released. His lawyers likened his treatment in 'solitary confinement' to that of Guantanamo bay. So one wonders when or if the general public are ever going to hear the 'details' and 'facts' or be shown some sort of "concrete evidence" about such allegations. Apparently this victim will appear before the Melbourne Magistrates Court later today and hopefully he won't be sent to the nearest "AA" Super-max prison for "social isolation" just in case ASIO aren't telling us the truth! INDONESIAN [politicians], police or military officers may have played a role in the 2002 Bali bombing, the country's former president, Abdurrahman Wahid has said. Australian Protective Service whistleblower Gary Lee-Rogers may have died at the hands of four people named in court yesterday by a former NSW police detective who backed his claims of corruption in the service. Australian Federal Police (AFP) Commissioner Mick Keelty has revealed information about an SMS message warning of an attack on a western embassy in Indonesia came from an Australian businessman in Jakarta. Federal Labor Party candidate Ivan Molloy says he supports the sentiments of his wife, a Queensland state politician, who blames the Liberal Party for the 2002 Bali bombings. Malaysia has hit out at an Australian plan to base counter-terrorism teams in South-East Asia.Malaysia says it has the capacity to deal with any threat of terrorism on its own. The threat from terror groups and failed states means Australia needs a high-tech, rapid deployment defence force, the defence minister says. Australia's Terrorism Wake Up Call  The horrific bombings of the Sari Club and Paddy's Bar in Bali, on October 12, 2002, considerably strengthened the hand of the CoW in pursuing the War on Terror. Here was an opportunity to harden the hearts of the Australian and US public against Islamic fundamentalists. It was also a chance for the Indonesian government to justify harsh measures in the war against terrorists and secessionists, such at those in the province of Aceh. Greens want Flood to front Bali inquiryGreens Senator Bob Brown wants the author of a key report into Australia's intelligence agencies to appear before a Senate committee examining the Bali bombings. Howard and Downer to blame for Jakarta bombing: JI? Alleged JI Members pushed back journalists at the site of a powerful blast outside the Australian embassy in Jakarta. The Federal Government has to be condemned for the bomb attack outside the Australian embassy in Jakarta. A Sydney court has heard that an undercover agent posed as a freelance journalist to expose a terrorist plot against Australian targets. Professor McMillan says while state and federal police cooperate in national security, there is less certainty about whether the state or commonwealth ombudsman should handle complaints about law enforcement. The Federal Government says it wants to establish an independent national anti-corruption body to improve accountability in organisations like the Australian Federal Police and the Australian Crime Commission because they're corrupt. If Roche wasn't "attention seeking" then he was bowled over and used by Howard to promote his war on terror, and his addiction to promoting Abu Bakar Bashir as the ringleader of some fictional group called (JI) made up by the CIA. Attorney General Phillip Ruddock said yesterday under the Crimes Act Izhar Ul Haque committed a crime. The Daily Terror is not holding out on us it has given a wide reaching scenario about the war on liberty and has not spoken to Brown the wife. Not spoken to Brigitte the husband and made up it's own case sensationally with the help of John Howard Philip Ruddock and ASIO. It has been revealed two complaints against Australia's intelligence agency ASIO have been upheld in the last financial year. But during the course of the police interrogation police come up with anything they can fabricate. More likely this is the interpretation of the police interview by police who have twisted the story. It is my understanding these are bent police on a mission. The Australian Federal Police and ASIO are believed to be investigating support groups in Australia specifically support groups operating out of Western Australia. The Australian Federal Police commissioner says investigations into terrorist links to Australia are being made more difficult by public debate about the progress of inquiries. Australia was alerted to Jemaah Islamiah, but did not consider it a prime threat, because it was a fallacy writes GI Joe April 22 03. Did the CIA blow up Bali? In a nation where conspiracy theories and rice are two of life's staples, Indonesians appear to be changing their habits. You can still get rice with your Kentucky Fried, but conspiracy theories easy to find, at least as far as the Bali bombings are concerned. Alarm over terror in 'Australia'? ISLAMIC extremists linked to GI cordial fired weapons and conducted close-quarter combat training in remote forests all over Australia. Paint Bombs were the weapon of choice. A spokesperson for Justice Action Mr.Sooth Sayer said " the arrest is most likely connected to the invasion of the mans privacy by the new powers of ASIO. These are extraordinary laws that were invented, using people as pawns to get unprecedented powers to use to lever John Howard's propaganda machine." US - In what civil liberties advocates call the most massive database surveillance program in US history, the Multistate Anti-Terrorism Information Exchange, or Matrix, continues to compile billions of records on law-abiding citizens and receive federal funding, despite public outcry and suspicion.